Do you have other pets in the house? Make sure they are up-to-date on their vaccinations and discuss bringing in a foster with your current veterinarian. It’s important to know if both pets (your current and your foster) are good with other animals, as well. Keeping everyone safe is first priority! Are you confident training a pet? 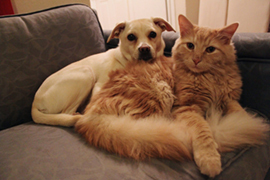 Most dogs and cats will be a little frazzled – especially in a new, strange setting. It’s important to stay calm (they can sense anxiety!) and read up on basic training techniques before you bring them in. Will the shelter be supplying a kennel, bed, food, litter, etc.? If not – enlist the help of friends and family that may have extra items for you to have. Give them their own space! Whether this is their crate or a corner of the living room with their bed in it. Creating a space just for them will make it easier to adapt in a new home. For fostering kittens and cats, keep them separated from any current pets for the first 24 hours. Bathrooms and spare bedrooms with few hiding places are good spots for feline fosters. Foster cats should have their own kitty litter, water and food in their space. Slowly introduce them to any current pets under supervision until pets are comfortable around each other. Ask the shelter a lot of questions about the pet! Do they have special medical, behavioral, or dietary considerations? Are they potty trained? Know as much as possible about the pet you’re trying to foster so you don’t end up taking the pet back to the shelter prematurely (talk about stressful for all parties involved). Bring home a pet and give them all the love you’ve got!